I never been to this place. Once again, it’s sent in by a web visitor. Thankz to him !~ However, No pricing has been mentioned. Anyone know howz the pricing like ? This entry was posted on Friday, February 24th, 2006 at 11:32 am	and is filed under Chinese Food, KL. You can follow any responses to this entry through the RSS 2.0 feed. You can leave a response, or trackback from your own site. would love to know more, since i stay nearby..
Now I remember this place, used to eat here too for crabs – made a change from Fatty Crab. It’s always packed too but the fried rice not as nice as Fatty Crab. Food standard has dropped. The curry fish head was really blend that day. Perhaps too many customers to serve? 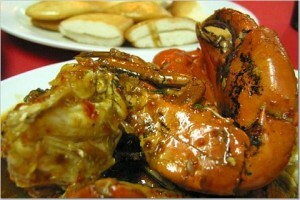 The ham tan (salted egg) crab was lousy and cost us a bomb too! almost RM50 for about 750 gram. Only the honey chicken was good. but then again, it was better last time. Not my recommendation.